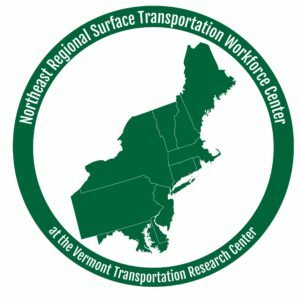 The Northeast Transportation Workforce Center (NETWC) is based at the University of Vermont Transportation Research Center (UVM TRC) in collaboration with The Center for Advanced Infrastructure & Transportation (CAIT). The Center serves 11 states and the District of Columbia. The Center is grounded in work at the UVM TRC designing and implementing a five-year FHWA Transportation Education Development Pilot Program (TEDPP) piloting programs across disciplines, mo des, and industry; broadly advancing a Career Pathways approach to transportation fields; and creating original curriculum and programs for high school, community college, university, and professional development of transportation workers. Parallel to this CAIT assembled a diverse partnership to create a Virtual Career Network for Transit, in addition to a number of other long-standing programs and research efforts. NETWC Stakeholders include multiple partners from Education, Labor and Transportation agencies and institutions across all modes and disciplines in 11 states and the District of Columbia. An inaugural advisory group was formed with key stakeholders helping to guide the development and strategic direction of the Center. Read more about our strategic plan at NETWC Strategic Plan. The Northeast Transportation Workforce Center (NETWC) is organized to make a significant contribution to ensuring the U.S. surface transportation system has a workforce that is resilient, skilled, efficient and effective in designing, operating, building and maintaining a 21st century transportation system that best supports the region and country’s social and economic vitality. NETWC builds strategic partnerships and engages regional and national stakeholders to develop a skilled and career-ready transportation workforce throughout the region. The NETWC was formed through an FHWA grant to compliment and create extended opportunities in transportation workforce development. NETWC is building a network that connects resources, promising practices, and, most importantly, innovative thinkers already engaged in transportation workforce development. The regional network supports and is supported by a National Network for the Transportation Workforce; five centers created together to work locally regionally and nationally, funded by grants through FHWA. You can see more detail of each of these initiatives in the Phase II: Job Needs and Priority Report, and provide direct input into the most effective strategies to advance them by participating in our stakeholder survey. Make a significant contribution to ensuring the U.S. surface transportation system has a workforce that is resilient, skilled, efficient and effective in designing, operating, building and maintaining a transportation system that best supports the social and economic vitality of the U.S.
A vital regional as well as national network for the transportation workforce is institutionalized resulting in attracting sustainably funded networks, providing increased quality access to all available transportation related workforce programs and materials, stimulating new partnerships for programs and research. For a printable version of our fact sheet, please click here.